Slim pickin’s and sloppy. But I’m hoping to have some actual blooms in March. Slim Pickin maybe, but very pleasant arrangement! i need to try scanning my flowers sometimes. nice mandala you made. 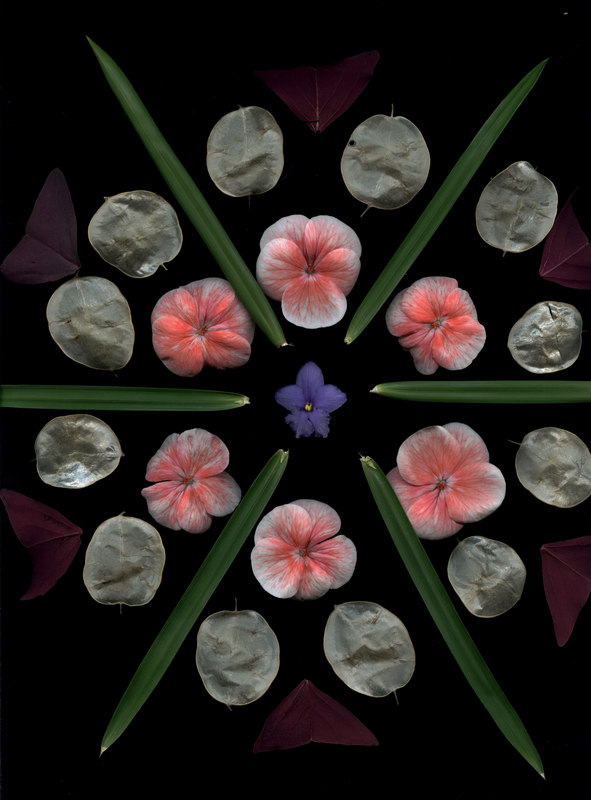 african violet, impatiens, lunaria, oxalis…what’s the grass? i thought maybe liriope, but then noticed the sheath at the bottom of the blades. Like a kaleidoscope. Love them. wow! I found your blog following Annie’s Annuals here in CA “Random Things we Just Love” I lived in Ellis Hollow the big bad winter of 1978-79 and through to the following fall. I never saw as much wildlife (even for the right years I lived in Alaska) as I did that almost year in Ithaca. My father-in-law was a chemical engineering prof at the University…but I am a true blue Pacific Rim West Coast loving four generation San Franciscan…somebody had to come a sell stuff to all the 49ers–my great-great grandpa Dallas thought it should be him! I am planning on growing a vegetable that I have only tasted in Ellis Hollow–and haven’t had since I lived there–SALSIFY–that taste is still poking my memory saying “find some seeds” after 33 years! thanks for the memory lane trip today!